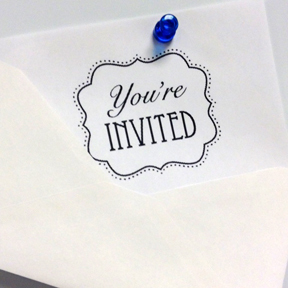 How do you handle invitations? Do you try to avoid social situations at all costs, or do you consider the privilege of an invite, understanding that someone thought of you and is requesting to spend time with you? Maybe you’re somewhere in between. As Christians, we should see every invitation as an opportunity to love others well. Yet, as someone who enjoys both giving and receiving invitations, I often see them handled poorly, and sadly admit to having made a few less than stellar navigations myself. So how can we best respond to these opportunities? To be clear, I’m not really considering general invitations, nor am I addressing events with particular moral concerns. I am focused here on personal invitations, those times when another person or group specifically invites you to spend time with them in a generally neutral setting. In those situations, how can we best show God’s love to others? Here are six points on navigating the invitation. 1. If you can go, go. If there’s nothing holding you back, accept the invitation. Be where people are. Jesus spent plenty of time with and among people. His first recorded miracle was at a wedding. (John 2:1-11) But Jesus was always present for far more than mere socializing. If we are to be like Him, to develop relationships and have meaningful conversations about His Kingdom, we need to be present and pursue others as He has pursued us. 2. Don’t make up excuses. 3. If you genuinely can’t make it, kindly decline. Life happens. You can't make it to everything. Maybe you can't afford it or you’re already booked. Maybe you’re not feeling well. By all means, don’t be generous with your germs, but do be sure to inform the person or group what’s happening with you. No need for lengthy details, but a response is truly appreciated and shows consideration for those who think well enough of you to include you. 4. Don’t say you’re coming if you’re not. Again, things happen, but it is a terrible feeling to wait in anticipation for someone only to be disappointed at a no show. There's never a reason to lie, and we should care enough for others not to forget or ignore them. This also has the potential to damage relationships on many levels, and for no reason, when our goal in love is to build others up in Christ. 5. Thank those who invited you. Acknowledgement is huge. Whether you can make it or not, let them know you’re grateful they thought of you. I’ve worked to improve on this myself, especially if I can't go. It’s a great touch with that person, and can lead to ministry opportunities down the road. You'd think this one obvious, but it’s no fun for your host or invitee (or you, for that matter) to have you present but miserable. This tends to happen when our focus is on ourselves and not on God and others. We’ve all been in situations which weren’t our preference, but it’s well worth finding redeeming moments. With a Master who went to the cross for us, living sacrificially should be our norm, and a few hours lived in deference to others for their good and God's glory is no great loss. If you'd rather be elsewhere, pray for the Spirit’s guidance and help with your attitude even before you arrive. Who does the Lord want you to connect with? The next time you receive an invitation, whether in person, by mail, text or on social media, consider the privilege of having someone reach out to you, and ask God how He’d like to use you in that person’s life, or even the lives of others if it’s a group event. As we focus on Jesus and on the people He puts in our lives, we can find countless opportunities to love as He loves and to share who He is, which is truly the greatest privilege of all.